I think that Mexican food is everyone’s favorite, but we do know that sometimes Mexican food can be high in fat, calories, and carbs if we make the recipes with flour tortillas, beef, and lots of cheese. I found this recipe years ago in a magazine called Taste of Home “Light & Tasty” and modified the recipe to suit me. I love my vegetarian version. I do plan to try to make this recipe using Nutritional Yeast instead of cheese soon. I have an addiction to cheese and am working on weaning this out of my diet. The vegetarian recipe is excellent and so is the beef version. Enjoy! In a large skillet, brown the beef until cooked thoroughly or the crumbles are heated through. Stir in the refried beans, beans, corn, jalapeno, taco seasoning and ¾ cup of the tomato sauce. Mix well. Combine the salsa and the remaining tomato sauce. Spread ¼ cup of the salsa tomato sauce mixture into a greased 13”x 9”baking dish. Layer 4 corn tortillas (these will overlap each other). Spread half of the meat or vegetarian mixture on top of corn tortillas, then spread 1 cup of the salsa mixture over meat or vegetarian mixture, 1 cup of the shredded cheese. Repeat the layers, top with remaining corn tortillas, salsa mixture and cheese. Cover with aluminum foil and bake @ 350° F for about 45-5 minutes or until the edges are bubbly and the cheese is melted. (IMPORTANT) Let stand for 10 minutes before cutting, if don’t wait 10 minutes the lasagna will break apart and be messy. Serve with Sour Cream, Avocado and onions. Makes 12 servings and the leftovers freeze very well. Hello fans! It has been awhile since I have done any serious cooking. Looking back at my food diaries and notes, I think my last post was January 17th. For that I apologize and I have missed cooking, creating new recipes to add to my lifelong commitment of eating and making healthy food choices. I created this dish to eat for lunch or dinner to go with a nice green/herb salad with simple vinaigrette dressing. 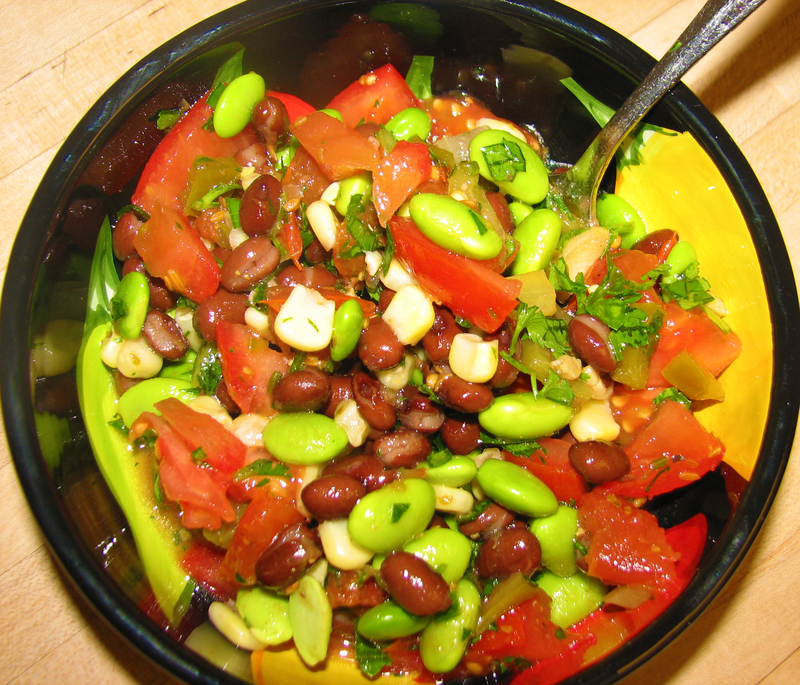 The flavors in this bean salad go very well together and it is a perfect dish to bring to a picnic barbeque or to simply grab a bite to eat when on the run. Enjoy! Combine all the ingredients together in a large bowl and refrigerate for a few hours to give the flavors a chance to marry. Eat alone or with a salad – serves 4-5 people.